The New Jr. Harvard Vest™ is a small version of IRONWEAR®'s Zipper Front Vest™ developed for Harvard medical researchers to make using a weighted vest safer and simpler. IRONWEAR® was the first company to create weighted vests for children and IRONWEAR® has continued improving weighted vests for children for the past 20 years. The Jr. Harvard Vest™ is the latest IRONWEAR® design and is available in a number of variations to address different special needs. (If you do not see the features you need in an IRONWEAR® product please let us know, our website only shows a fraction of the products we make). The Jr. Harvard Vest™ is designed to make wearing a weighted conditioning vest as safe, comfortable, and simple as possible. Every aspect of the Jr. Harvard Vest™ makes it the safest and most comfortable weighted conditioning vest for children. First are the Flex-metal® weights which are the softest and most flexible weights made. The weights act as padding and will protect the child and things and others around them. Second is the vest construction which is ultra thin, breathable, and soft. Because the pockets which hold the 1/4 and 1/2 lb. weights are spread uniformly over the whole vest, the load can be uniformly distributed with minimal thickness. Two thicknesses of weights are available with 1/2 pound soft Flex-metal® weights the thickness is 1/2 inch and with 1/4 pound weights the thickness of the vest is only 1/4 inch. Not only are these weights thin but they are so very soft and flexible so they can go unnoticed by the child wearing them. To help keep the child cool the whole surface of the vest is constructed of soft knitted large open cell athletic mesh. 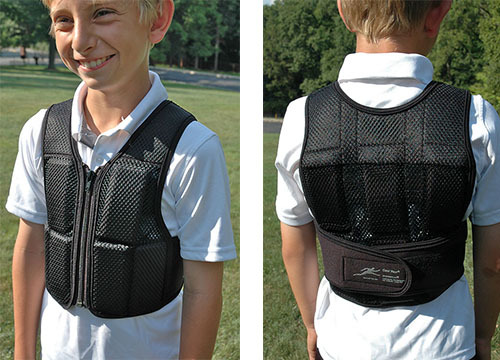 The mesh allows air to flow easily through the vest, between the weights, and between the vest and the child's body. This makes the vest usable in all seasons, indoors or outdoors. the breathability of the vest and its thin sheer design makes it easy to wear under or overtop most clothing. The vest is extremely soft everywhere, besides the soft Flex-metal® weights the shoulders are padded with a soft foam laminate, the bests are padded and even the edges of the vest are padded with a soft stretch binding. Third the design and tailoring of the vest make it very simple to fit perfectly and adjust the weight amount easily, and put it on and off quickly. When fitting the vest the first time, just unzip it and put it on the child, then with it unzipped release the overlapping torso belts in the back (make sure to release both the end of the belt velcro and the velcro on the edge of the front of the vest, the belts should then be hanging loose on either side.) Then zipper up the vest and attach the torso belts around the back of the vest at the desired snugness. (If needed the torso belts can be adjusted at any time to change the fit or for a different child). Once the back torso belts are adjusted only the front zipper is needed to put on or take off the vest. The vest can be adjusted with the torso belts to comfortably fit children from approximately 30 to 70 pounds with chest sizes from 18 to 32 inches. The vest is 14.5 inches long from the top of the shoulder to the bottom near the child's waist. The Jr. Harvard Vest™ weight pockets are located on the inside of the vest so that the weights cannot come out accidentally while the vest is being worn. There are 6 weight pockets on the front of the vest and 8 weight pockets on the back of the vest. Each pocket has a stretch open slot invented by IRONWEAR® through which the Flex-metal® weights can be inserted or removed. Each weight pocket can accept one 1/2 pound Flex-metal® weight or up to two 1/4 pound Flex-metal® weights. With the vest's 14 pockets the vest can be loaded with up to 7 pounds. The vest shell itself weighs just over a 1/2 pound so the total maximum loading is 7.5 pounds. Loading and unloading of the weights only takes a few seconds. Once inserted, the Flex-metal® weights are held securely on all sides. Since no hardware is used to lock in the weights, there is nothing to chaff the skin or wear out.